The Honors College is celebrating its 10th cohort this year. Former Texas A&M University-Commerce President, Dr. Keith McFarland, and current Dean of the Honors College, Dr. Raymond Green, led the project to create the Honors College, which welcomed its first cohort in 2007. Although there have always been phenomenal students on campus, the pair aimed to create a scholarship to help recruit a concentrated group of students with positive high school track records. The scholarship, which sounds too good to be true, includes full tuition and fees for four years along with free apartment housing, partial board and a stipend for textbooks. Along with working to recruit and retain competitive students, the Honors College aimed to expand the honors curriculum and establish a residential learning community of Honors Scholars. Since the college welcomed its first cohort of 55 students in 2007, the cohorts have become more competitive academically. “The Honors College has been more successful than any of us had expected and that is primarily due to the leadership of Dr. Ray Green,” said McFarland. The college has also contributed to an increase in undergraduate research productivity, with a greater number of undergraduates presenting at conferences and having their work published in peer reviewed journals. In addition, their post graduate work has become stronger. The college itself currently has an over 90 percent medical school acceptance rate and a 100 percent veterinary school acceptance rate. Last year alone, multiple Honors College students received acceptance into fully funded PhD programs with one student receiving acceptance from nine universities. Other students were accepted into their top choices for law, physical therapy schools and master’s degree programs. Dr. Green hopes the program will continue to see this rate of success. The Honors College recently held a reception in which Honors College students, alumni and faculty were able to celebrate the college’s success. Students in the Honors College are required to complete 30 hours of honors course credits, maintain above a 3.3 grade point average, successfully propose and defend an honors thesis and complete 96 service hours prior to graduation. In addition, every Honors College student meets individually with the Assistant Dean of the Honors College, Dr. Yvonne Villanueva-Russell, each semester before registering for classes. Each Honors College cohort includes approximately 50 students. In 2010, the Honors program added Regent’s Scholars. Regent’s Scholars receive a more global education and a scholarship which pays for about 70 percent of their tuition, fees, room and board. Approximately 30 Regent’s Scholars are chosen each year. Students in the program develop leadership skills throughout their time at the university and participate in a study abroad experience, typically at the end of their junior year. Regent’s Scholars follow the same application process as Honors College students. 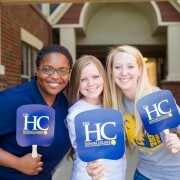 For more information about the Honors College and honors program, visit www.tamuc.edu/honors.